I heard about the 78 ditch about two weeks ago, and ever since we’ve been in a frenzy to find its exact location. I was in contact with Jason Oliva, an old school skater who hit the place over 20 years ago. Through searching Youtube, some blogs by Jason on House Of Steam’s wordpress.com account, and some extensive Google Maps usage, we were able to locate the 78 ditch. We followed the fence, did a little house keeping to make it skateable again, and documented with stills and video. The “Green Door,” some rails, plenty of tags, and drop-in points are all there. It was an awesome day and lots of people went in to making it happen. We will definitely be there again. For anyone that needs the help, contact us for directions. We will bring back to glory of the 78 Ditch! I cant believe how overgrown it is most of those trees on the righthand side were not even there 22 years ago…you could be seen skating it from the highway now its nice and shady. So the cycle continues…Most of the grafitti on the ditch was there before any of us showed up in the mid 80’s I also remember a guy named Ray Bolbe(sp) would be there riding an old school long board. I dont think we will ever know who found it first but it was not us so things get passed on. Cant wait to see it again when I am back in the states. This entry was posted in 78 Ditch and tagged 78 Ditch, ART, backyard ramps, boards, east coast, house of steam, jason, Jason oliva, jasonoliva, New Jersey, New York City, oliva, paintings, photography, pool Skating, ramp, ride, sk8, sk8t, skate, skate decks, skate history, skate photography, Skate ramps, skate trucks, skate wheels, skateboarding, skateboarding history, skateboarding photography, skateboards, skatepark, skater, SKATERS, steam, Street Skating, TEAM STEAM, The Barn, The House of Steam, thos, vert, vert ramps, Vert Skating on January 28, 2010 by jasonoliva. I grew up in Easton PA. We used to drive or have our parents drive us to Bethlehem and skate at “The Trench” This was in the later 70s and early 80s. It was on the side of a highway, I cant remember which one? Skaters from all over skated there. Ramps were built everywhere at the top to extend the walls. It was a fairly big trench. Skated with Kenny Sigafoos, Jon Smith, Gary Muesler. I wish I had photos, a legendary place. Many great memories there! Malcolm, is it possible that you are referring to the “Dust Bowls?” I have no idea where it got the name because it features no bowls at all, but it is a really awesome ditch with cool things such as wallrides and a steep hip, and yes, there has always been extensions built to extend the walls. Some wood, some concrete. There’s even a ditch that runs off of the main ditch, a smaller ditch, which is also fun to skate. And I know this is a pretty legendary spot. By the way, I think the highway it’s next to is 76, and it’s in King Of Prussia PA.
One of my favorite skate spots. I have a couple of pics from a recent session there with Derek Rinaldi. I will post some pics from Patrick of the Dustbowls tomorrow…see if it jogs your memory. I spoke with ken sigafoos. “the trench” is along the side of 378 in bethlehem. Im sure I have some photos packed away from skating there. ill send them to you if I can find them. Is that the same place that is referred to as the Dust Bowls? I dig the NI site as well…is that your site? No way dude!!!! 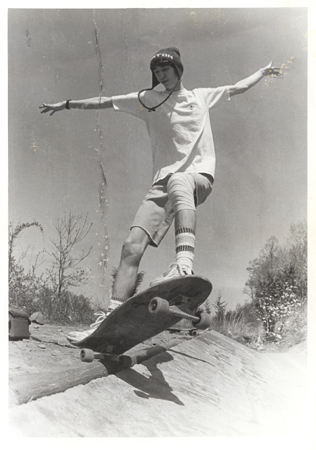 OK, I remember skating that thing with Dennis, Jimmy, Stevie D and Murph; I think it was Murph that found what look like a 2′ by 4′ barn door, and he made a launch ramp next to the ditch by proping it up on a log. We would ollie out of the ditch, ride through the dirt and use it as a lauch ramp, land in the dirt then roll back in the ditch. Then Jim moved it closer to the ditch so you could launch off of it right back into the ditch. I will never forget riding through the dirt, over a small barn door propped up on a log, and ollie back into that ditch, and then getting tubed in the pine trees. GOOD TIMES!!!!! Great place…We used to call the tube of pine trees the green door exit..too much fun, cant wait to go back someday. This is a great vid. Like Jay said. We skated the “78 Ditch” all the time. We were lazy and just parked on the side of the highway. The NJ State Police would stop a check us out. We took Steve Olson there and they ran him for warrants. After a while they would look up, see us skating and let us be. I shot a Super 8mm film for AV class at the ditch, which included the police footage and all, with a Raging Lamos sound track. I’m still searching for that. I distinctly remember the Samurai getting stuck on a large hump of dirt we had to cross…most likely put in place to keep cars from driving back there. So great to see NEW vid of that place and to know we have young brothers out there still seeking it secret bounty. This is the Ditch closer to Bridgewater and NOT across from the highschool right? Someone had contacted me via the YouTube vid I posted of Weep at the ditch about a year ago. Don’t know if it was you PJ, or your one of your buds. Regardless, it brings back a flood of memories just like most of THOS archive. Matt, Weep, Corn and I used to get to it from the back via Mountain Road and not just park on the highway begging to get busted. But looking at Google Maps it looks like there are houses now where the path from Somerville Road used to be. I have such fond memories of going there late summer afternoons after a day of skating vert. Great post! Yea the houses were built some years ago I assume, but its at somerville and mountain like you said. no, not my site. its always been called The Trench. Ive never heard of the dust bowl before. Im going to ask ken sigafoos what highway its next to. i havent skated there in 25+ years. Just wanted to chime in too that the ditch in this post is not the Dust Bowl that is out near King of Prussia. YO i have been researching the 78 ditch and have desperatly been wanting to go here and skate with my friends. Could u give me the directions on how to get there. i live in Warren is it close to Watchung Hills Regional High SChool? It’s not far at all from WHRHS…I’m actually heading out there tonight to skate it with one of my friends from Warren. You just have to go onto Mountain Rd heading west off of Martinsville Rd (we’re normally heading from Mt. Horeb). You’ll end up passing the Devil’s tree. When you get to the end of Mountain Road make a right onto Somerville Road and the ditch will be on your left (South side of Rt 78). Just find a side street to park on since there isn’t a good spot on Somerville Road. We normally cross over the overpass, park on the street on the left, then walk back over the overpass. Then you can either hop the fence or walk alongside it by this one house and there is a gap in the fence to go thru. Keep walking and you’ll find it, just try not to attract the attention of people in the houses. We first found it at night with no flashlights without any difficulty. Let me know if you need any more help, we plan on skating it a lot.